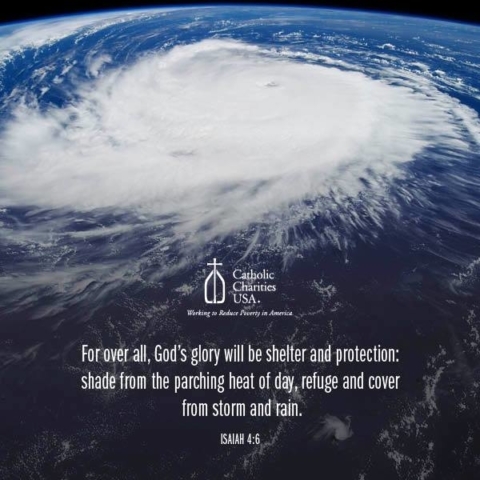 Catholic Charities USA (CCUSA), the official domestic relief agency of the Catholic Church, is monitoring the progress of Hurricane Harvey, along with the local Catholic Charities agencies in Texas and Louisiana, and taking action toward assisting in the recovery efforts. Even before the storm hit land, CCUSA launched a text-to-give campaign, and the response on the part of donors has been very generous. Funds raised will assist Catholic Charities agencies in the affected region to extend emergency help to families and individuals. Additionally, the US bishops are launching a collection that will assist Catholic Charities in both the immediate and long-term recovery efforts. If you would like to contribute to the recovery efforts, are resident in the US, you may text CCUSADISASTER to 71777 or visit www.catholiccharitiesusa.org. The CCUSA Disaster Recovery Team is coordinating the relief efforts from the Catholic Charities nationwide network. The impacted agencies have been asked to list their specific needs, including the number and amounts of gift cards, and gas cards. CCUSA will then distribute the list to other Catholic Charities agencies and manage the disbursements. In addition to basic supplies, CCUSA will provide technical assistance, the deployment of staff from other agencies, as well as short term and long term recovery grants. As the rains continue to fall in Texas and Louisiana, CCUSA is actively engaged in responding to the catastrophe and planning ahead for the recovery of the communities affected. A member of Caritas Internationalis, Catholic Charities USA is the national office for Catholic Charities agencies nationwide. Catholic Charities USA’s members provide help and create hope to more than nine million people a year regardless of religious, social, or economic backgrounds. To learn more about CCUSA, please visit our website at www.catholiccharitiesusa.org.